One of the most iconic antique American furniture is this Chippendale carved mahogany block-and-shell bureau table made by John Townsend. Rarer still that this desk is signed by none other but the maker himself! There are less than ten of these bureau table known in existence and they are housed in the Met, Art Institute of Chicago, Winterthur Museum, Yale University Art Gallery, MFA, Houston, and private collections. John Townsend (1733-1809), regarded by historians/collectors as one of the very best Newport cabinetmaker, was the son of Christopher Townsend (1701-1787). Brother Job and Christopher Townsend founded the cabinetmaking dynasty in Newport, Connecticut in 18th century. In 1767, John Townsend married Philadelphia Feke, the daughter of America's first native-born portrait painter, Robert Feke. As with any custom furniture today, in 18th century, clients can also request variety of models to suit their needs. This bureau table has all the bells and whistles of this particular model. The top drawer is embellished with three shells. The convex shells are carved and applied on while the concave shell is carved directly onto the solid mahogany drawer front. Furthermore, the recessed center door also has a concave shell to echo the shell on the top drawer whereas a cheaper model would just have an arch instead. For those lucky American furniture collectors, it is extremely rare to find a signed John Townsend furniture. And to find it on this newly discovered iconic bureau table is even rarer. The bidder can find more info at Christie's website. 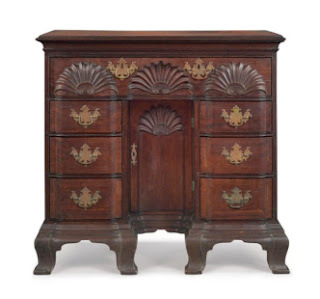 As with any American antique furniture, the key to desirability of these pieces at auction is always condition (any replaced parts), lineage (can the piece be traced to its original owner), and patina (has the said piece be left alone or cleaned by its owners). Judging from the low estimate, I'm assuming it's because the table has been cleaned (the middle part is definitely brighter than the feet). Had the table been left untouched, it probably would command at least 30-40% more at auction (I sound like Keno brothers on Antique Roadshow. haha). Kinda crazy really. Who would have thought dirty things cost more than clean things? LOL. Guide to various online SALES!